1958 - Bob Sponenberg moves from New York to Fitchburg, MA after getting married. He invests $200 in some tools and starts doing kitchen installations and small carpentry jobs in the local area. The majority of his work is for Angel Cabinets of Fitchburg, MA. 1962 - Bob not only installs kitchen cabinetry, but begins to design and sell them out of his home office in Leominster, MA. 1966 - Bob builds a garage next to his house to store cabinets and build laminate countertops in. 1970 - As his business grows, Bob rents warehouse and shop space in different locations throughout the area. 1972 - Bob's main line of cabinets, Angel Cabinets of Fitchburg, MA, goes out of business. Needing to find a replacement, Bob becomes a Wood-Mode dealer. Bob purchases property at 112Whitney St. in Leominster, MA and opens his first showroom. The building has shop and office space as well. Kitchen Associates becomes the incorporated name of the company. 1976 - Bob purchases an old furniture store and warehouse at 104 Mechanic St. in Leominster, MA, with the goal of remodeling the building and moving the shop and showroom. 1979 - With the remodeling complete, the shop, showroom, and offices move to 104 Mechanic St. Leominster, MA. 1987 - As the counter and cabinet business grows, more shop and warehouse space is needed. Bob purchases land on Rte 12 in Sterling, MA to build a new 20,000 sq. ft. facility. Approximately 5,000 sq. ft. is to be used as showroom space. 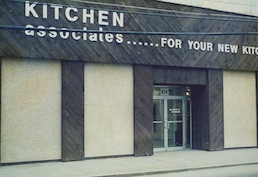 1989 - Kitchen Associates moves it's location to 76 Leominster Rd. (Rte 12) in Sterling, MA. With more and more solid surface counters being fabricated, a second company called Sterling Surfaces is started and begins working out of the same facility. Sterling Surfaces helps to generate more solid surface work to other kitchen dealers and millwork shops. 2004 - A 12,000 sq. ft. addition is added to the building to allow more efficient space to fabricate solid surface components as well as providing additional warehouse space.